Pulmonary fibrosis is also known as scarring of lungs. This is a type of respiratory diseases in which the tissues on the lung become scarred, and damaged. As a result, the functioning of lungs gets affected. When the scarring of lungs tissues takes place, it results into thickening of walls in lungs. This results in reduced supply of oxygen to blood. As a consequence, shortness of breath is observed in a patient with pulmonary fibrosis. As the pulmonary fibrosis becomes worse, the shortness of breath also becomes worse progressively. Other symptoms of pulmonary fibrosis experienced are chronic dry cough, fatigue and weakness, weight loss without any reason, experiencing discomfort in chest, chest pain, and experiencing pain in joints and muscles. 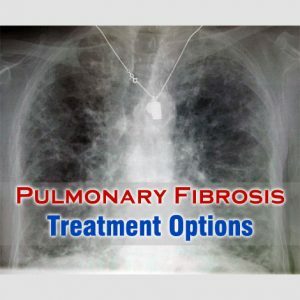 There are no specific pulmonary fibrosis treatment options that help in repairing the damaged lung tissues. Treatment involves in easing the symptoms and improving the quality of life. Corticosteroids are the most commonly prescribed medication for treating pulmonary fibrosis. These medications help in reducing the inflammation and also in preventing further scarring or damaging of lungs tissues. Sometimes, these medications are prescribed in combinations with medications that suppress the immune system such as acetylcysteine. FDA has also approved nintedanib and pirfenidone as medications for pulmonary fibrosis. These medications help in slowing the pulmonary fibrosis in mild and moderate cases. Oxygen therapy is used when the oxygen in blood becomes low. This one of the pulmonary fibrosis treatment options also does not help in repair the scarred lung tissue. But, it helps in improving breathing, reduces pulmonary hypertension caused due to low oxygen in blood, and also improves your sleep, and well-being. Pulmonary rehabilitation is an exercise program, which teaches about the lung disease, exercises that helps in treating and living a better life, support, and counseling. Lung transplantation surgery is considered, when all others pulmonary fibrosis treatment options fails in showing any improvement and in severe cases. Patient’s longevity and quality of life improves with lung transplantation, unless and until the patient is not facing any other significant health problem.